Walnuts are tree nuts that are often grown in orchards dedicated specifically to walnut production. A serving of 1/4 cup of walnuts provides 4 g of protein, 2 g of fiber, and are an excellent source of omega-3 fatty acids. Roasting walnuts does not change the nutritional value of the food, though it brings out the nutty flavor. Walnuts can be dry roasted or tossed in light amounts of oil to add extra flavor. Spread shelled walnuts on an ungreased baking sheet in one even layer. The natural oils from the nuts will be released during cooking requiring no extra oil or spray to keep the nuts from sticking. Toast the nuts in the oven for five to 10 minutes until lightly browned. You will need to stir the nuts occasionally using a wooden spoon to keep them from burning on one side. Remove the pan from the oven and sprinkle the walnuts with salt. 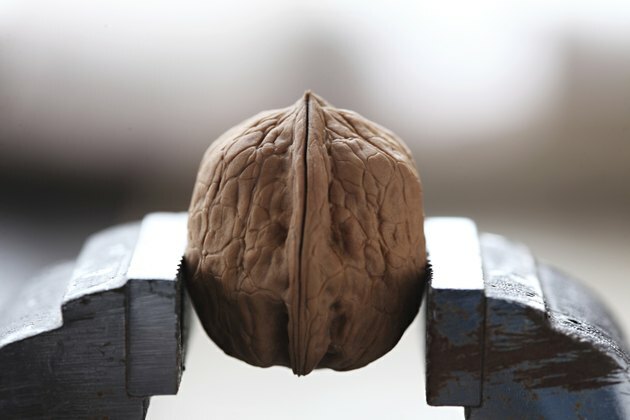 Allow the nuts to cool completely before serving.